The automotive world has come a long way since those immortal words uttered by Henry Ford almost a century ago. Or has it? When it comes to car colours, whilst paint technology has advanced massively, customer tastes have not really moved on a great deal since the first Model T rolled off the production line. Black took the top spot of car shades in 2017, according to the Society of Motor Manufacturers and Traders (SMMT). 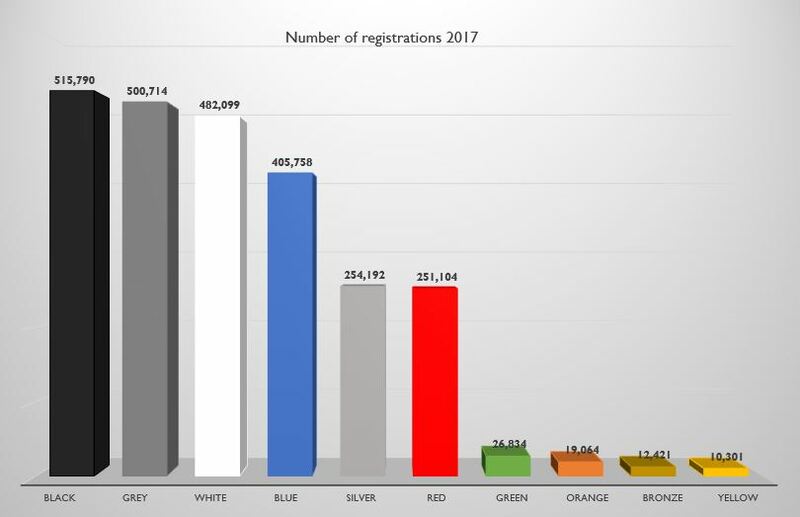 More than half a million black cars were registered last year, 20% of the total market, overtaking white, which had been the favourite of motorists for the previous four years. Perhaps reflecting the somewhat gloomy economic outlook reported by the media, grey also staged a popularity comeback, moving into second place with white, blue and silver rounding out the nation’s top five colours of the year. Over the past 20 years or so, colour experts and paint producers working with manufacturers have turned predictions and palette choice into something of a science, colloquially known as automotive chromatics. By tapping into ‘real world moods’ and looking into the latest research on the socio-economic landscape, colourists and technologists attempt to reflect consumer sentiment in the range of hues available. Hyper HD: A “colourful and impactful theme that welcomes self-expression, performance and modern technology” based around primary colours, aimed primarily at small and city car buyers. Colour firm, Pantone, predicts an increase in more organic shades over the next few years. Colours such as yellow and orange are growing in popularity for volume brand new car buyers in Europe, whilst more natural metallic shades such as bronze, copper and gold are making a return in the luxury sector. In fact, bronze entered the colour chart’s top 10 for the first time since 2011, replacing brown, demand for which fell by a third year on year. Whilst the automotive manufacturers and their respective coatings suppliers continue to push the envelope, Autoglym is also at the forefront of research and development in surface technology. LifeShine, our vehicle protection system, just got even better. Newly formulated for 2018, a highly significant property is now included in the paintwork protection mix – colour enhancement. This means that a single application doesn’t merely protect the vehicle’s paintwork, it also provides superior depth of colour, helping to return even used cars closer to their former ‘as new’ brilliance. Tests carried out with four competitor products showed that the improved LifeShine product had a far superior depth of colour difference of up to 31%. With dealerships turning to the used vehicle market amid falling new car sales, this will doubtless prove an invaluable tool, enabling them to further add value while increasing penetration rates on pre-owned vehicles. To find out more about LifeShine and how it can benefit your customers and your dealership business, call us on 01462 677766.